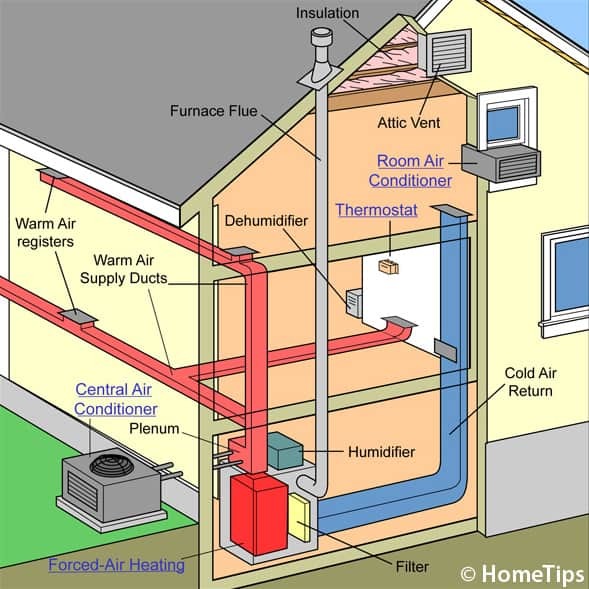 A central air conditioner has a primary appliance such as an air handler or furnace located in an out-of-the-way place such as a basement or attic. This appliance pumps chilled air throughout the house through a system of air ducts—often the same system utilized by a forced-air furnace during the heating season. One or more thermostats in the house turn the cooling system off and on as room temperatures rise and fall. 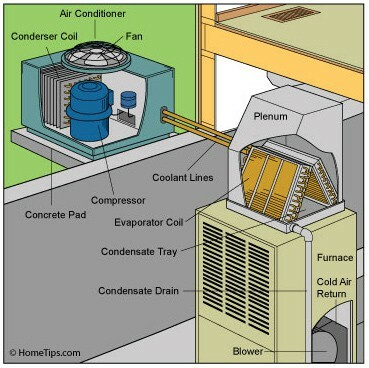 A central AC runs on electricity and removes heat from air with basic refrigeration principles. When the thermostat signals the air-conditioning system to lower air temperature, a whole sequence of events begins. Refrigerant such as freon circulates through copper tubing that runs between these components. This refrigerant receives and releases heat as it raises and lowers in temperature, changing from liquid to gas back to liquid. The refrigerant is especially cold when it begins to circulate through the indoor coil. As the air handler pushes warm air across the coil, the refrigerant absorbs so much heat from the air that it turns into vapor. As a vapor, it travels to a compressor that pressurizes it and moves it through the outdoor coil, which jettisons the heat. A fan also helps to dissipate the heat. The refrigerant then passes through an expansion device that converts it to a low-pressure, low-temperature liquid, which returns to the indoor coil. And so the cycle goes. A clear explanation, with diagrams, of how a central air conditioner cools a house by cycling refrigerant through its system.